I have not prepare butter cake for quite a while and suddenly I have a craving for it. 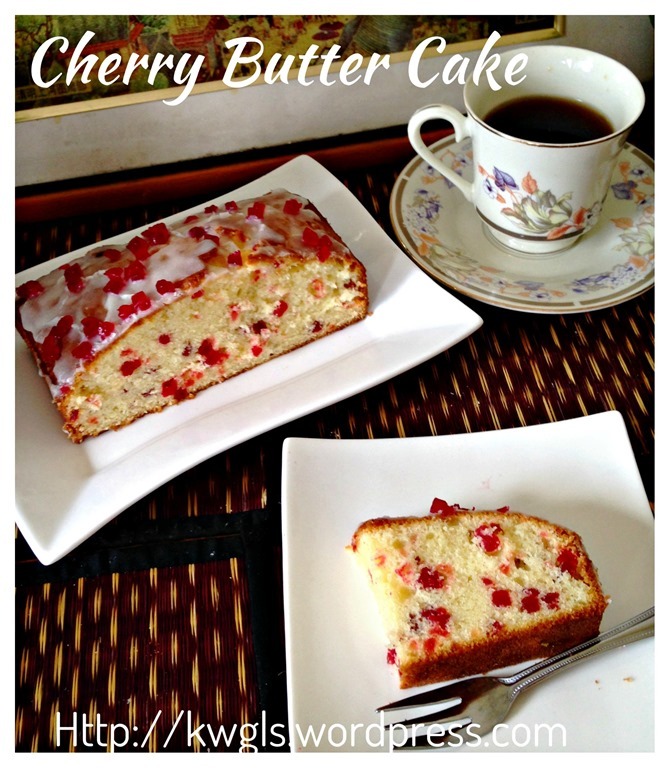 I searched the kitchen cabinet and found a pack of diced glazed cherries that was leftover from the preparation of Biskuit Dahlia or daisy biscuits. 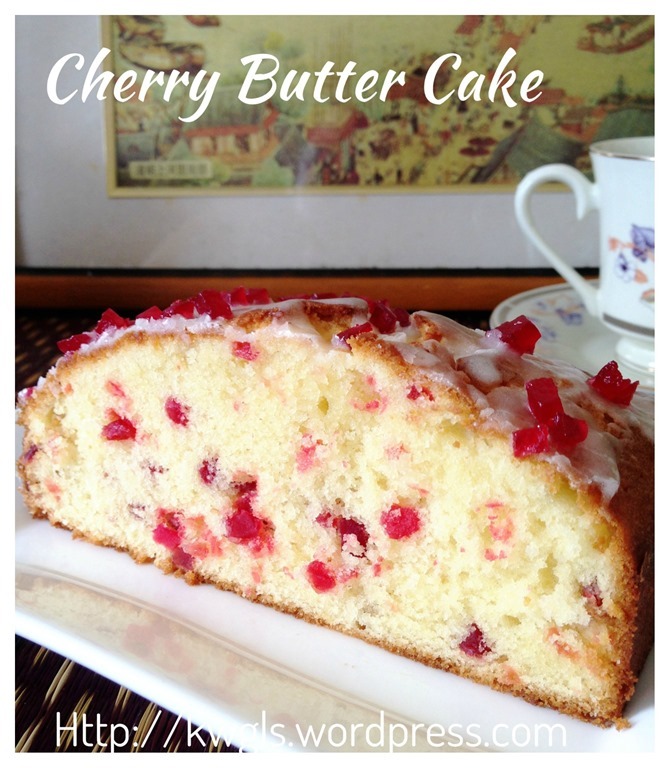 Immediately, it reminded me of the cherries butter cake that we used to eat when we are young. 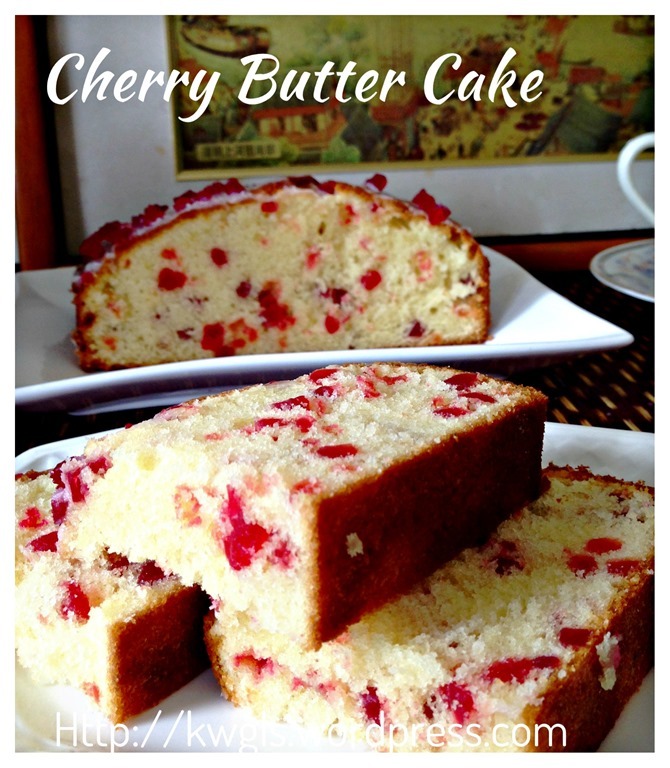 When I was young, I can recall that diced cherry is a common item in bakes and usually comes in either green or red. It was even more popular than raisins and other nuts. i am unsure of the reasons but probably because it is much cheaper than raisins and other nuts. Preparation is fast and easy. It is a very small cake prepared using only 2 eggs and the common creaming method. 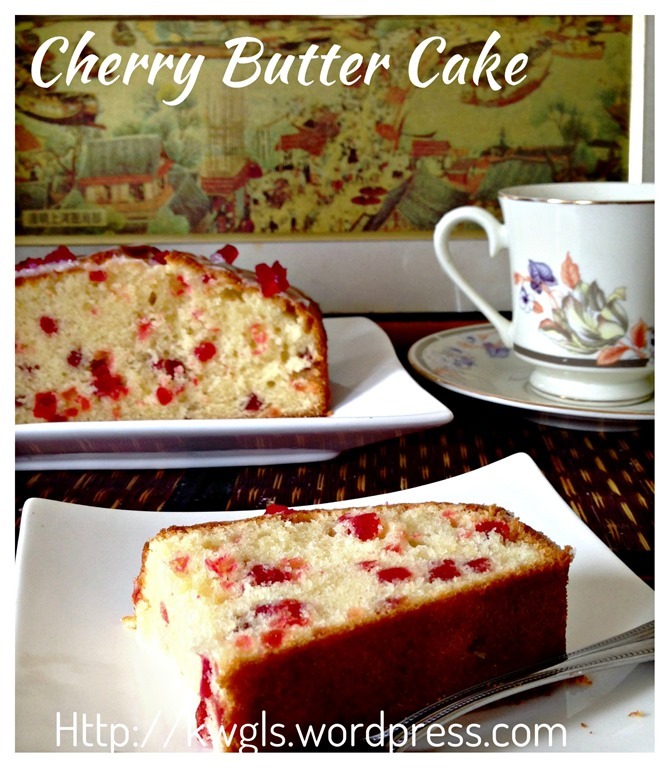 It is slightly different from the traditional butter cake as I have added some ingredients such as creams and condensed milk to enhance the texture of the cake. 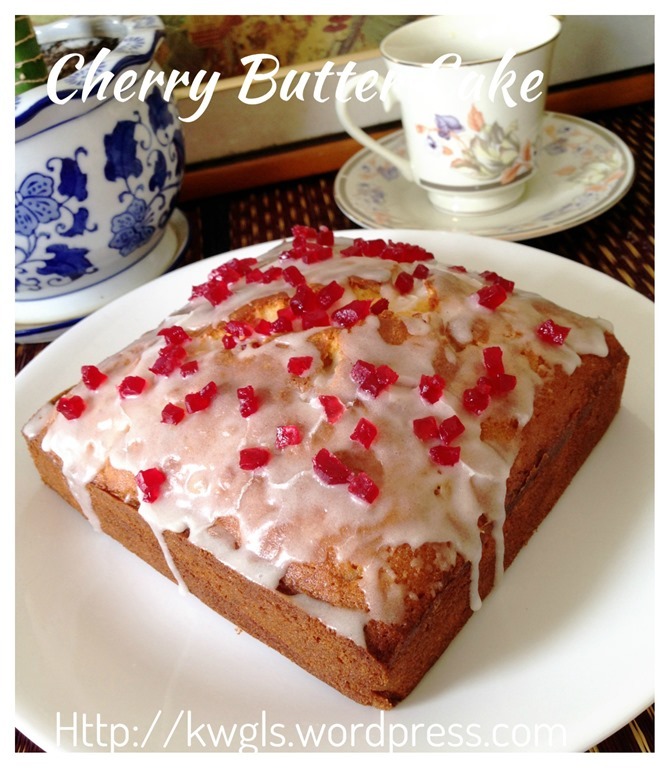 Traditional lemon glaze was drizzled over the cake to give the cake some lemony tanginess flavour. 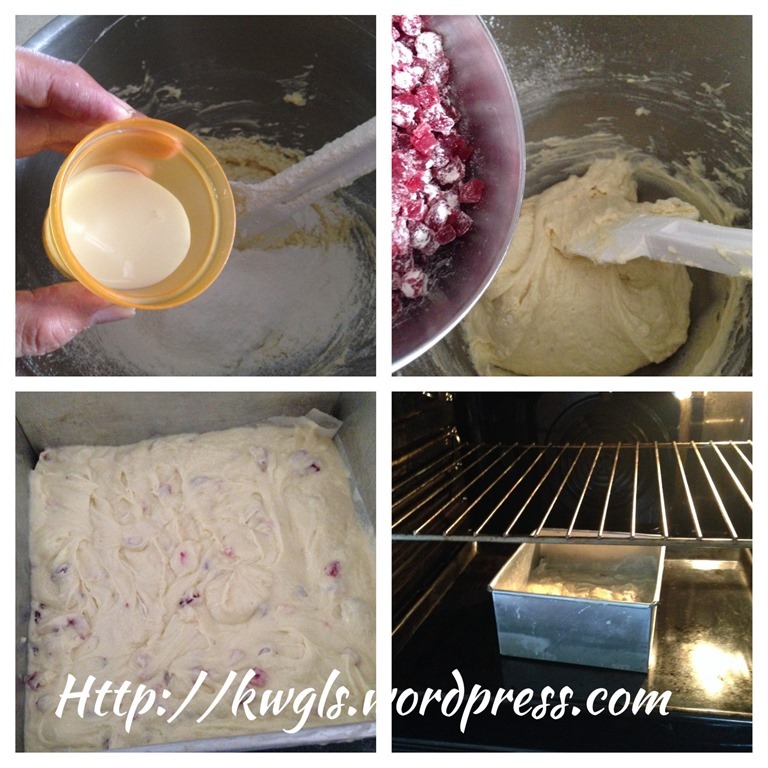 Lightly grease an 6” x 6” baking tin preferably with a detachable base. Alternatively, line the baking tin with parchment paper. 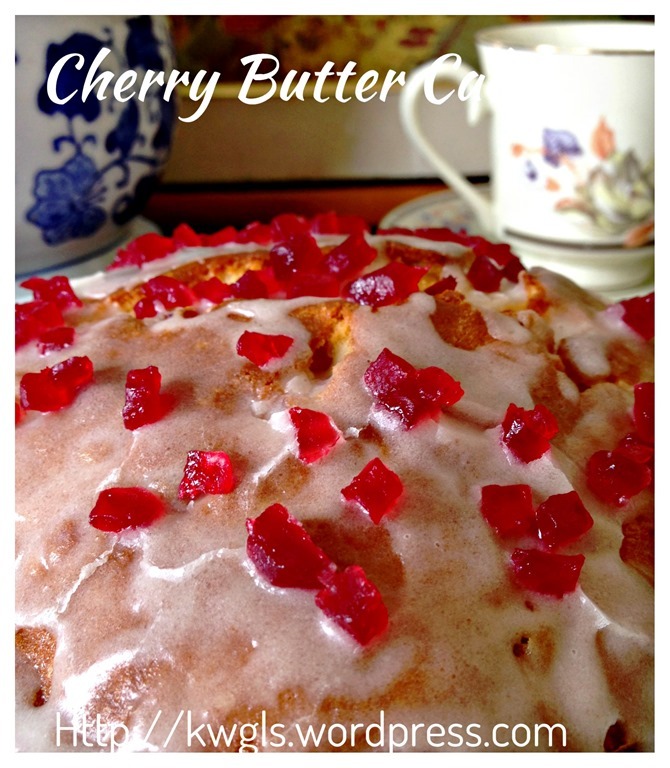 Put one tablespoon of self raising flour on the dice cherries and coat it as evenly as possible. Cream the butter and sugar until light and fluffy, add in the vanilla essence, eggs, condensed milk and use slow speed to “mix” until well combined. Eggs should be added one by one and scrap the bottom of the bowl to ensure no unmixed egg settled at the bottom of the mixing bowl. 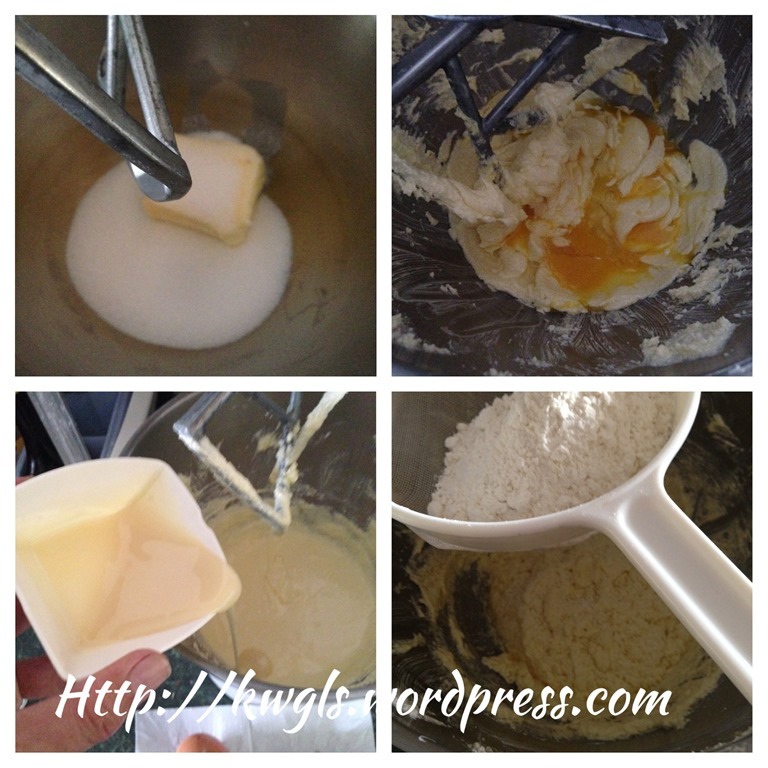 Sift in 1/3 of the self raising flour and fresh cream and use the spatula to quickly fold in the flour.. Continue with the remaining 2/3 until all the flour and fresh cream are added. 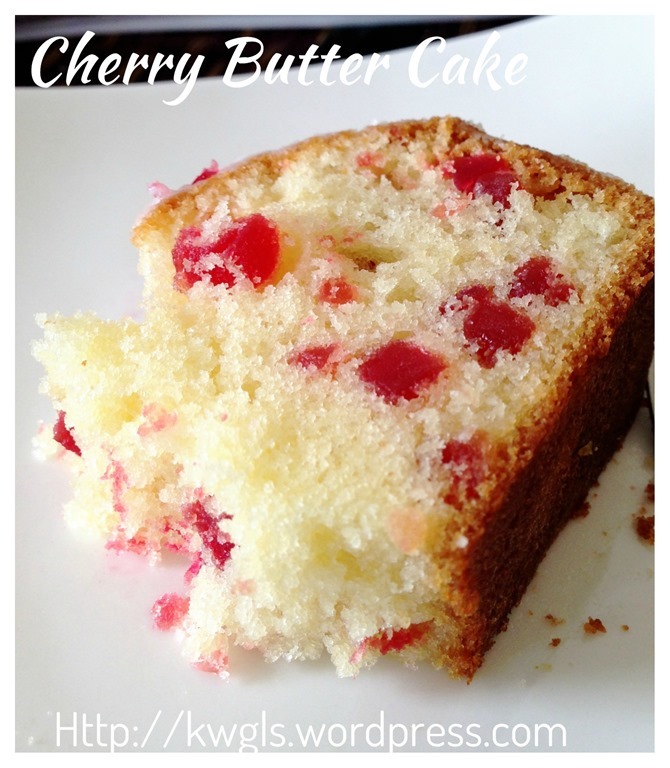 Add the flour coated diced cherries, lightly and swiftly stir until well mixed. Transfer to the baking tin, level and bake in the oven (at the lowest shelf) at 160 degree Celsius at 30-45 minutes or until a skewer inserted comes out clean. The baking time is for your reference and depends very much of the size of baking tin. Skewer test is still the final test. Transfer to a rack for cooling. For lemon glaze, stir the icing sugar and lemon juice until well combined resembling a paste and drizzle over the cool cake. If the glaze is too dry, add lemon juice DROP by DROP. If the glaze is too wet, add additional icing sugar TEASPOON by TEASPOON. Cut only when completely cooled. There is nothing to shout about this butter cake. 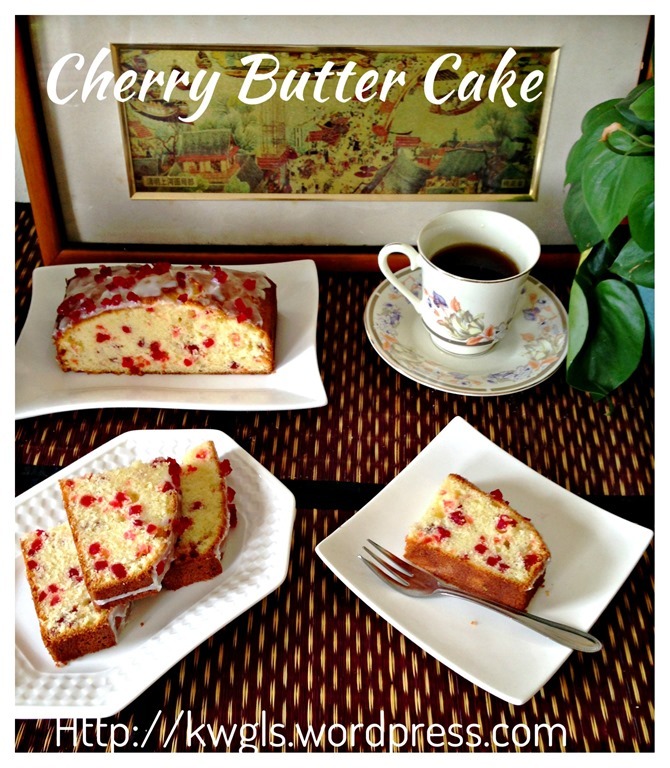 It is a rather classic butter cake with slight modification. 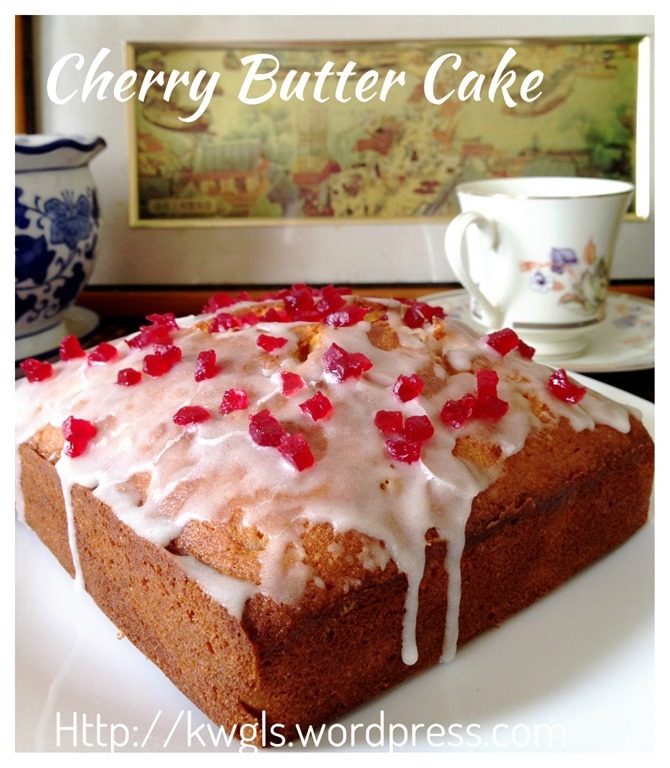 In my humble opinion, I do not think that it is necessary for readers to go and buy cherries just for the cake unless you missed eating the cherries. You will have a hard time finishing the diced cherries as the packing can be rather big. 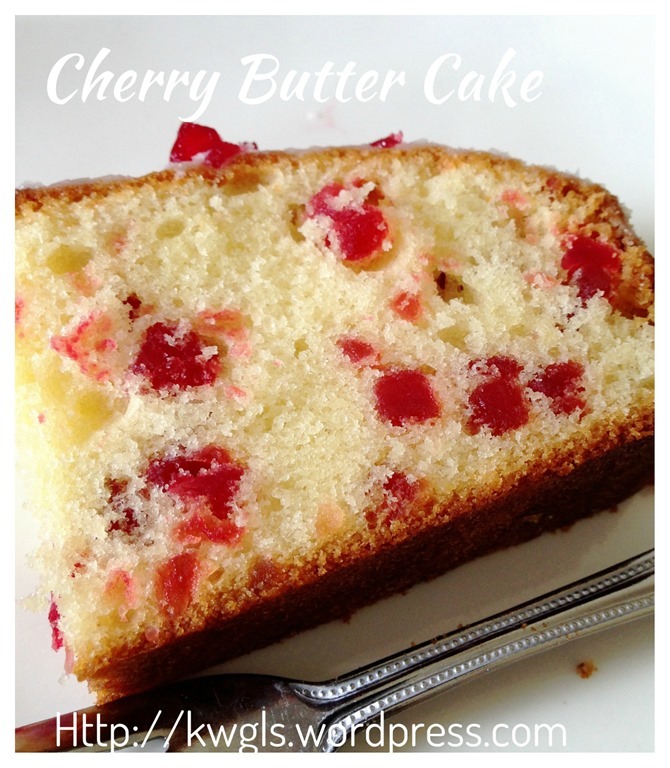 Do feel free to change it to other butter cake like almond, walnut or even raisin butter cake..
Don’t worry about the sweetness and the recipe had been adjusted to take into consideration of the sweetness from diced cherries and condensed milk. However, if you are using other nuts rather than glazed cherries, you may want to add additional 10 grams of sugar to your cake. 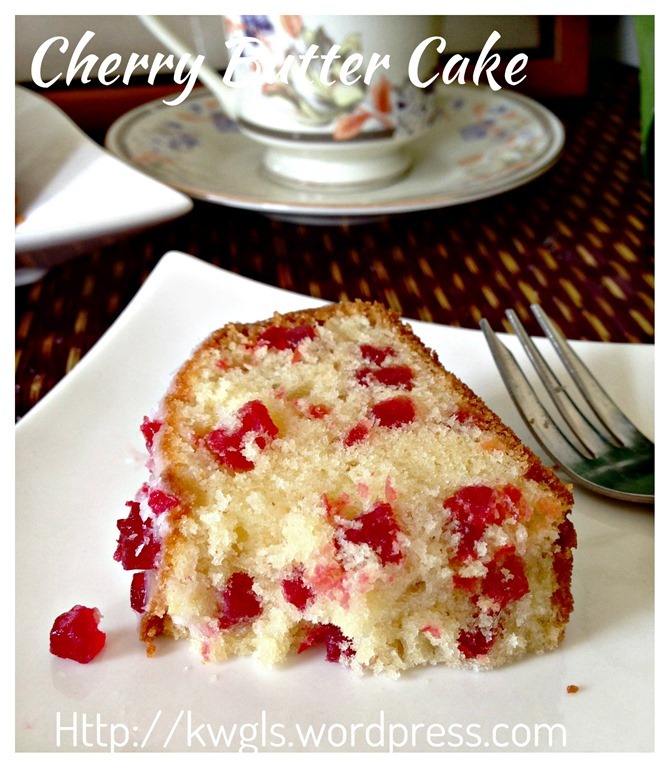 This entry was posted in Cakes and cookies, Food Preparation Series and tagged 8, butter cake, cherries butter cake, cherries cake, Guaishushu, guai_shu_shu, kenneth goh, postaday, 樱桃牛油蛋糕. Bookmark the permalink. I love how easy this cake is compared to some of the other cakes! Delicious, Kenneth! Hi Kenneth! This cake would be perfect for CNY!!! Red and yellow – very auspicious! May I ask if I’m not using self-raising flour, how much baking powder/soda should I add? 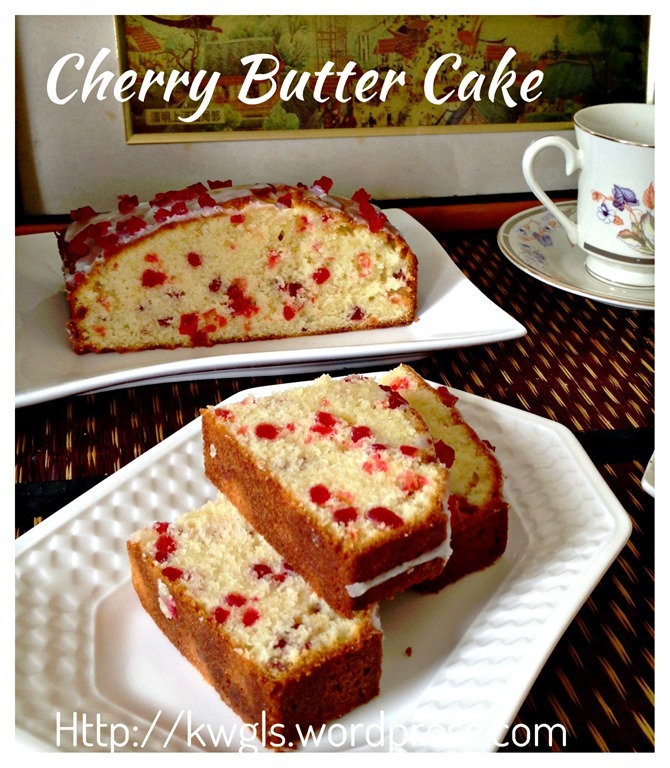 Does it affect the texture of the cake? Love your recipes. I’ve been inspired to bake. Thank you. Possibly you can look at this how to prepare self raising flour (http://food52.com/blog/8375-how-to-diy-cake-flour-and-self-rising-flour) . 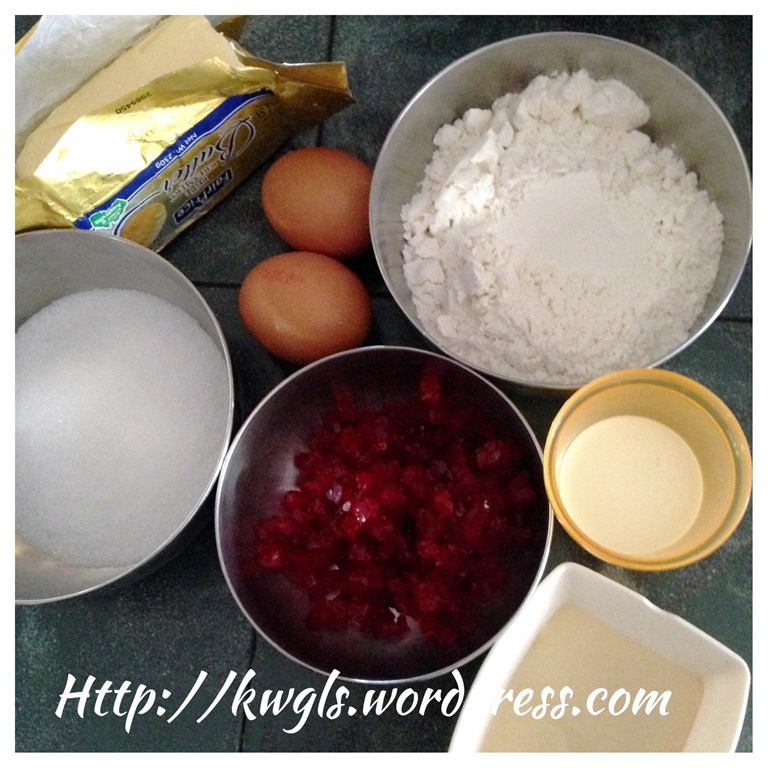 It is usually 2 cups of plain flour use 2.5 teaspoon of baking powder plus 1/2 teaspoon of salt. Theoretically it would not affect the texture of the cake. Such A beautiful and colourful cake, makes me think of Happiness when I see your cake. Thanks for sharing.